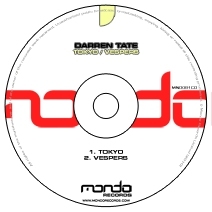 Mondo godfather and UK mastermind producer Darren Tate kicks 2010 off in fine style with a super hot EP setting up the path to his eagerly awaited third album 'Horizons 03'. Straight on the back foot of his massive rework of the Angelic classic 'It's My Turn' and last year's stunning 'When The Morning Comes', Darren returns to deliver more of that Tate magic with his new two track EP. Kicking off the EP is the beautifully crafted 'Tokyo', a banging peak-time cut that manages to blend eastern culture with Tate's trademark razor sharp production. With its addictive melodies, gorgeous breakdown and thumping bass line Tokyo is Tate at his best. On the flip you'll find 'Vespers', an equally timeless production that incorporates beautiful chords and stirring emotional melodies as only Darren knows how. Vespers is quite simply an uplifting and emotional masterpiece that will cause major damage on the dance floor in 2010.